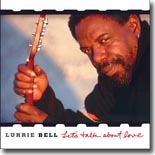 Let抯 Talk About Love (Aria B.G) is a personal triumph for Lurrie Bell, who has experienced his share of adversity. In 2007, Bell lost both his partner, Susan Greenberg, and his father, Chicago blues harmonica legend Carey Bell. It抯 not as if Lurrie hadn抰 survived enough hardship. He already had triumphed over a debilitating bout of mental illness that stretched through much of the �s and �s, during which he抎 even gone homeless for a time. Through it all, Bell took refuge in his music. In choosing the edifying songs for this album, 揂 theme started to emerge,� says producer Matthew Skoller, who chose all the songs, 揳nd that theme was love.� None of the 12 songs were written by Bell, but the conceptually innovative blues stylist makes each one of them his own. Bell is joined by several Chicago blues colleagues including Felton Crews (bass), Kenny Smith (drums), and Sidney Wingfield (keyboards). Billy Branch抯 superb harp appears on one track. Together, they comprise the city抯 upper echelon of blues artists. Lurrie抯 bursting at the seams full of feeling guitar style isn抰 flashy. Nor is it slashing or stinging, but it will leave its mark on your soul. His earthy vocals are rough but tender. The shuffling title track is modern day traditional Chicago blues at its finest. Quite simply, the entire 46-minute disc could be described the same way. It may not be one of his most often covered songs nor a classic like Spoonful, but "Earthquake and Hurricane" is undoubtedly Willie Dixon. Andrew Brown抯 "You Ought To Be Ashamed" isn抰 the most memorable song, but each one of Bell抯 finger-plucked lead guitar notes sounds wonderful. Hip Linkchain抯 "Cold Chills" is a simple boogie but Anthony Palmer抯 potent rhythm guitar and Bell抯 intense lead guitar make it brilliant. With a shrill harp, Skoller raises a commotion on two songs. "Turn To Me" is a slow minor key blues. Is there a better kind? "Missing You" � written by another Chicago blues guitar colleague Billy Flynn � can be interpreted as an admirable farewell to Greenberg. The song is so sad, it抯 sweet. How Bell is capable of singing the loving lyrics without breaking down is proof that he is a rock of strength. At this time in his life, there likely isn抰 a more suitable song for Bell than Pop Staples� "Why (Am I Treated So Bad)." Via affectionate vocals and probing guitar, Bell expresses his pain. You抣l feel it so much that you will hurt. But like a canker sore you can抰 resist touching, it抯 a pleasure to experience. Bell comes across musically mature on his triumphant first solo release in eight years. You almost sense him as a wounded veteran carrying the torch through the homestretch so that it can be handed on to another generation. As Skoller observes in his liner notes, 揕urrie is now a blues master. There are very few blues masters left.� He may not have the dynamism of Luther Allison, but along with John Primer, Magic Slim, and Lil� Ed Williams, Bell may be the last of the great Chicago blues guitarists. After listening to this real deal blues CD, you抣l realize that Bell, like Chicago, is loaded with the blues. To say that 2007 was a rough year for Lurrie Bell would be a major understatement. Last January, Bell lost his companion and soulmate, Susan Greenberg, to cancer. More than anyone, Greenberg, who was also the mother of Aria, Bell抯 young daughter, helped him battle back from the personal demons that threatened to derail his career and kept him mostly inactive for nearly a decade between the mid �s and mid �s. To make matters worse, Bell抯 father and mentor, harmonica player Carey Bell, died in May of 2007 of heart failure. It抯 safe to say that many held their collective breath wondering how Bell would respond to two such staggering losses. He threw himself into his music, formed his own label, Aria B. G. (named after his daughter), and released Let抯 Talk About Love, which has to be his most personal release so far, no small feat for Bell, who always poured a lot of himself into his recordings and performances. Consisting mostly of covers, Bell puts his own personal tag on each of these tunes. Ray Agee抯 title track is spiced up with a lively arrangement and punctuated by Bell抯 always fiery and daring guitar work. Willie Dixon抯 underrated 揈arthquake And Hurricane� gets an update as well, and is one of many standout tunes. 揊eeling Good� is a nice, relaxed number featuring Bell on acoustic guitar. Guitarist Billy Flynn抯 揗issing You� sounds autobiographical as Bell delivers a heartfelt vocal expressing his anguish and loss, and his performance on Little Richard抯 揇irectly From My Heart To You,� both vocally and on guitar is first-rate, as is a high-energy take on Hip Linkchain抯 揅old Chills.� Another highlight is a second Dixon cover, 揅hicago Is Loaded With The Blues,� a slow burner featuring plenty of Bell抯 powerful guitar, and the closer, Willie Williams� 揥ine Head Woman,� a nice slice of good old Chicago Blues. Joining Bell on the album are Sid Wingfield (piano), Kenny Smith (drums), Anthony Palmer (rhythm guitar), and Felton Crews (bass). Billy Branch plays harmonica on one cut and co-producer Matthew Skoller plays on two others. The production is excellent, and allows Bell plenty of room to shine. Based on Let抯 Talk About Love, fans can breathe a sigh of relief for Lurrie Bell. He抯 still facing down the demons of his past and has emerged from what had to be one of the most difficult times in an already turbulent life to release this stunning disc that captures the real essence of the blues: love, loss, hope, despair, fear, exuberance, and, most of all, joy.